How does a Dutch architect end up doing volunteer work in the often unbearable heat of Jordan? Florentine Visser reports. The importance of this voluntary work lies more in the personal exchange than in the actual 'work' itself. The latter is good for a sense of making a useful contribution. After all, even locals can paint or plant trees. But working together on someone's home creates a bond and mutual understanding. As I had arranged my own visit I was not part of any construction group, and a single woman building in the traditional villages is uncommon. And then there is the language barrier. Looking back, I don't mind that I never managed to carry stones. That's not easy when it's 50° C in the afternoon. My introduction to the local culture of living and building was an educational experience that helped me put things in perspective. Around 22% of the Jordanian population lives below the poverty line, which means that they are unable to support themselves. Over the past year I travelled to different parts of Jordan on different occasions to learn more about the population and their living conditions. From the perspective of a Dutch architect, many things can be improved. Imparting knowledge about building techniques that are common in the Netherlands – timber window shades and cavity walls to name just two – but unheard of there is very satisfying. But the conclusion was always that money was needed to solve problems, and there was no money. So the designer had to steer creativity in another direction. Minimalism ended up acquiring an entirely new meaning. One of the problems with dwellings in Jordan is the indoor climate. The means of keeping out the heat are insufficient. Some people have a ventilator that offers a little relief. But keeping out the heat with building and architectural elements is a better starting point. It is remarkable just how often all windows and doors are left open, allowing the sun's heat to enter directly. Windows in southern Europe are protected with timber sunshades, and that led to the idea of placing sunshades in front of the windows as a way of improving the interior climate using minimal elements. Much of the north of the Jordan valley is used for banana cultivation. To boost income levels, development agencies have opened workshops in some villages. Here waste material from the banana plant, the dried leaves, is used to make baskets of different sizes that are sold to tourists. The idea arose to make sunshades from dried banana leaves. Habitat started to study the idea. The first prototypes, made of bamboo because of local conditions, now hang on the Habitat office. The test this summer will be to see how they function. Architecture is returned to the essence of building and living. It serves not only the pleasure of the designer but also that of the occupant. The latter is often overlooked, I think, in recent Dutch housing, where architects do their best to be as original as possible so that they make the magazines. Yet domestic architecture is really about occupants. 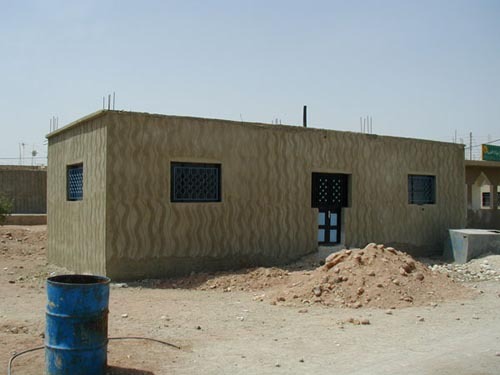 Habitat adopts a unique working method in Jordan. It doesn't use mass production. Instead it examines the individual needs of the residents and takes local conditions into consideration. The living space must meet the needs of occupants, and they themselves must help build it. 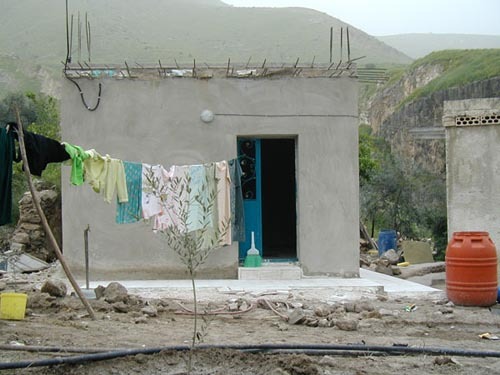 Improving the often miserable living conditions means improving the quality of life. Contributing to that process by imparting knowledge is very satisfying. Thanks to the contacts I made through Habitat I learned about a competition to design a water- and energy-efficient extendible living unit for low-income groups. Besides taking second prize, I came up with a number of new ideas to make dwellings withstand the heat better. At the end of July I left for a four-month stay with Habitat in Jordan where I will examine which ideas could be deployed in building homes with local people. My first visit to Jordan two years ago made a deep impression on me, particularly the countryside and the hospitality of the inhabitants. Meeting people who have next to nothing yet who still share their food with you is a very special experience. Some of that Arabian hospitality would be very welcome in the Netherlands. The difference in wealth is enormous. What I carried in my backpack was probably worth more than all a Jordanian's personal possessions together. I decided I wanted to go back again, and this time to give something back to the country and its people. I decided to find an organisation that I could do volunteer work for. Since graduating as an architect I have been particularly interested in housing and fascinated by how people live. Surfing on the Net I came across Habitat for Humanity, an agency that builds houses together with local people. Development occurs with local people. The people themselves play an active role in improving their living conditions. The process is slow but the effects are long-lasting because the people themselves, not some outside force, take responsibility and do the work. It's a way of working that appealed to me. I contacted the office in Amman, and after a few e-mails and phone calls back and forth I was ready to spend my three-week building holidays doing volunteer work.